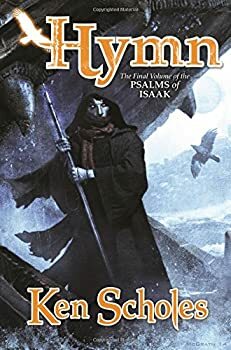 Ken Scholes brings his PSALMS OF ISAAK series to a close with Hymn (2017), a novel that satisfactorily ends the series, even if the novel is perhaps a bit weaker in comparison to its predecessors. One of the series’ strengths has always been Scholes’ vibrant imagination, and Hymn retains that quality here, building on earlier concepts and adding new ones, which I won’t detail here so as to avoid spoilers. Another positive quality of the series has been its, well, positive quality. By that I mean that while some horrific things happen in this series (and this book) there always remains a sense of optimism and warmth arising from either plot or the characters. Rather than an unremitting catalog of the ills of human nature, Scholes balances pain with joy, ugliness with beauty, despair with wonder, tipping things more toward the up side of the ledger, which I for one appreciated. If Hymn’s strengths are familiar, so are the aspects I was less fond of. I hesitate to call all of them flaws, as sometimes it’s just a matter of personal preference. For instance, I’m rarely a fan of this type of structure — very brief chapters following one upon the other, often with changes in POV. I find it often distracts and detracts from the reading experience, and in particular lessens the emotional impact of scenes when we immediately jump away from whatever event or realization created that emotional hit. The same hold trues here, but this has been the structure even since the series’ start, and at some point, you have to just accept that an author is writing the story they envision, not the one you necessarily want. Your mileage may vary on this one. In a similar vein, I’d rather Scholes had allowed the reader a bit more space in terms of characterization — we get a lot of internal monologue that gives us what characters are feeling or thinking, and I wouldn’t have minded less telling. Again, this is a matter of stylistic preference, so others may have no issue with it or not notice it at all. Last in the, “if this were my book” critiques, I’ll just add that as with the earlier books, I would have liked a stronger sense of world-building in Hymn, which has always felt a little thin to me. Plot-wise, Scholes does wrap up the series neatly, offering series’ fans a full sense of resolution, even as he opens up some nooks and crannies for future tales in this same world, though again, I won’t say exactly how to avoid spoilers. Suffice to say I’d be extremely interested to see more of this universe. Though the plot does tie things up nicely, it did feel a little more perfunctory than in prior books, a bit more flatly presented, lacking some of the spark and wonder we’ve seen before. Partly adding to that is the sense I had of characters speaking too often in aphorisms, so that dialogue and character interaction felt more than a little stilted or constructed. That said, there were several emotionally powerful moments in Hymn that, if they didn’t wholly negate the novel’s overall flatness, did allow one to forget about it for a while. I would have liked a strong novel to close the series in terms of the stand-alone nature of the work, but the satisfactory resolutions, those above-mentioned moments, and the quality of the earlier books makes PSALMS OF ISAAK an easy series to recommend. Published December 5, 2017. 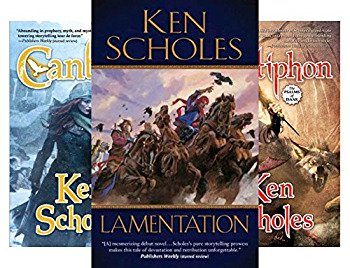 Ken Scholes completes his five-book epic that began with his acclaimed first novel Lamentation. The battle for control of The Named Lands has captivated readers as they have learned, alongside the characters, the true nature of world called Lasthome. Now the struggle between the Andro-Francine Order of the Named Lands and the Y’Zirite Empire has reached a terrible turning point. Believing that his son is dead, Rudolfo has pretended to join with the triumphant Y’zirite forces―but his plan is to destroy them all with a poison that is targeted only to the enemy. In Y’Zir, Rudolfo’s wife Jin Li Tam is fighting a war with her own father which will bring that Empire to ruin. And on the Moon, Neb, revealed as one of the Younger Gods, takes the power of the Last Home Temple for his own.